Vietnam is refreshingly practical. If someone needs to bring twelve cases of water across town, they (defy the laws of gravity and) load up twelve cases of water on to their motorbike and drive them across town. There’s no search for a larger vehicle, corralling a crew to help, or coordinating pickups. They just get it done. When things are broken, they fix them. When things aren’t broken, they don’t fix them. And when they’re tired, they take a nap, even if it’s behind their convenience store countertop or in the bowels of an incredible cave. Pairing perfectly with this practicality is the Vietnamese sense of playfulness. Vietnam radiates fun and it’s infectious. These people have fully grasped the concept that life is too short to spend it stressed. I’m no expert, but I think it would be really difficult to have a bad time in this country today. After writing this post I realized I used the word “fun” about eight thousand times. Instead of pulling out the thesaurus and tossing in “enjoyable,” “merry,” and “pleasant,” I decided to make them bold as an enthusiastic punch that this country so deserves. Because Vietnam isn’t “enjoyable,” or “merry,” or “pleasant.” It’s raw, and rough, and a good ‘ol fashion barrel of FUN. Really this “guide” could be condensed into three words: Go to Vietnam. But where’s the fun in that? So, here are a few key measures I took that resulted in a pretty incredible month in this Southeast Asian Wonderland. Reuniting with a friend always seems to give me that “this is what life is all about” feeling. The reminiscing, the laughs, the familiarity—sort of unbeatable. Now pair this with the insanity that is Saigon and you’ve got a lethal recipe for a fun time. 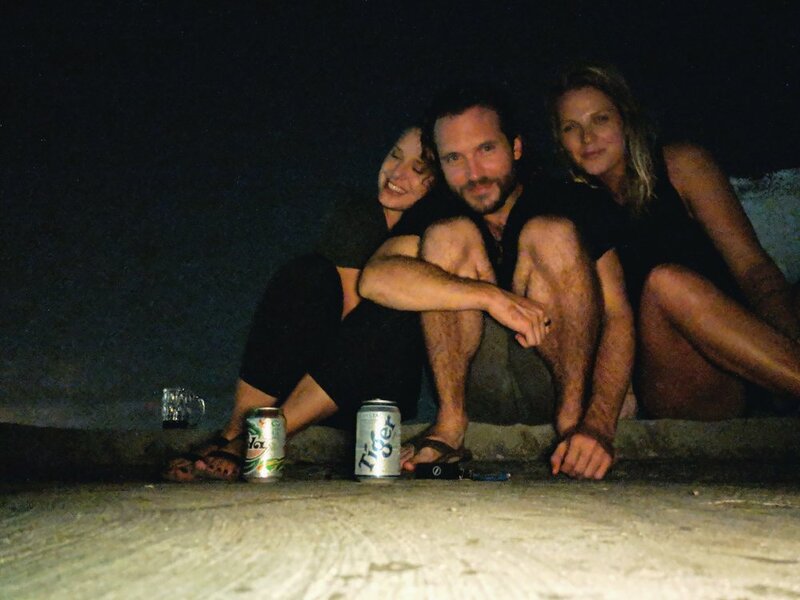 On my last night in Ho Chi Minh, I stayed with my high school friend, Miah, and his awesome girlfriend, Kelsey, in their beautiful apartment in the outskirts of the city. A couple years ago they decided to shake things up: They sold all of their belongings in California, got English teaching certifications, and moved to Vietnam. Uprooting yourself and moving to a foreign land is no easy task, but these guys make it look like child’s play. They’re not just living in Vietnam, but totally thriving in their new environment. We started the night with some craft brews at one of their go-to spots before making our way to an outdoor seafood restaurant. We ordered big bowls full of cockles, one in a creamy coconut broth and another in a sweet, sticky sauce. Plus, a massive, expertly grilled fish. Although it was tempting, we passed on this alien-sized lobster and instead ordered another round of beers. Before meeting up with Miah and Kelsey I hadn’t seen a familiar face in over two months. Hanging with them was crazy fun, but also very comforting. I think it’s true when they say there’s no place like home. But when you’re not quite ready to go home, there’s nothing like hanging with your homies. 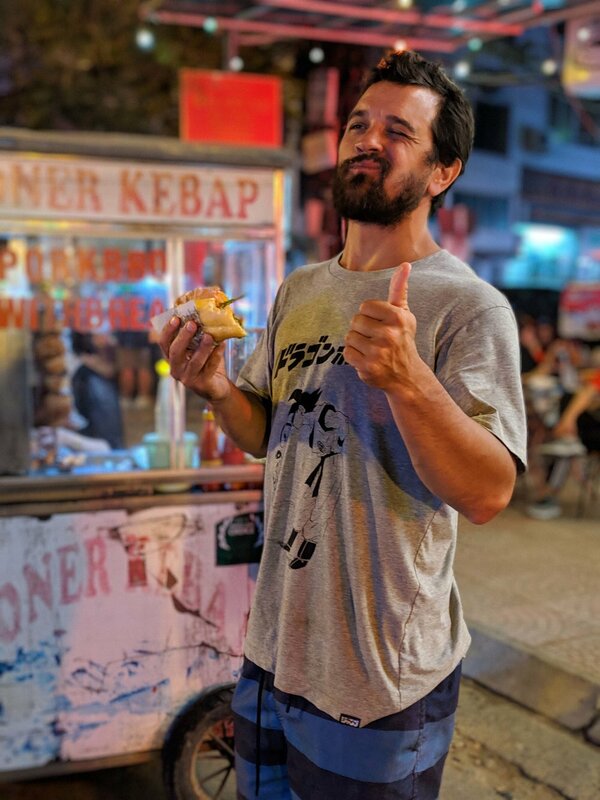 I met Blas drinking beer and eating spring rolls in Ho Chi Minh. And this likely set the tone for our nearly-month-long-eating-drinking-expedition up the country together. I’ve met loads of really nice, friendly people on this trip. But I wouldn’t use either of those words to describe Blas. Sarcastic, assertive, and goofy seem a bit more appropriate. As it turns out, sarcastic, assertive, goofballs make pretty killer travel partners. Over the last couple months, a lot of people have asked me what it’s like to travel alone. Most of the time, I really, really love it. Traveling alone puts you out of your comfort zone and into situations that you may not otherwise experience when traveling with others. It’s empowering and leaves you feeling extremely capable. But traveling with Blas reminded me how much fun it is to travel with someone else. In a way, it allows you to relax a bit more, to breathe a little easier, and to just enjoy the ride. For instance, motor biking through a huge thunderstorm and taking cover under a random house’s garage alone would be pretty stressful and scary. But motor biking through a huge storm and taking cover under a random house’s garage with someone else is fun and thrilling. Appreciating a new culture alone is great. Independently seeing some of the most beautiful landscapes of your life is also great. But there’s something very cool about sharing these experiences with someone else. Someone who is simultaneously observing and absorbing these same unforgettable moments. So, next time you find yourself alone in Vietnam, keep your eyes peeled for an Argentinian travel buddy. Bonus points if they’re hilarious and always up for an ADVENTURE. When I arrived in Vietnam I had no intention of renting a motorbike. From what I heard (and saw) scooting around the streets, especially the metropolises of Ho Chi Minh and Hanoi, seemed dangerous, stressful, and difficult. I’ve ridden a scooter plenty of times before, but when you see that massive wave of two-wheeled, metal machines coming towards you, the last thing you want to do is dive in. When I flew into Ho Chi Minh my plan was to take a series of buses up the country, ending in Hanoi. But after one motion-sickness-inducing van ride, another last-minute bus cancellation, and a long-delayed flight, I opted for a more hands-on transportation method: the motorbike. This was, by far, the best decision I made in Vietnam. Riding a bike not only gives you more travel freedom, but it also allows you to experience the more conventional or overlooked parts of the country. Some of my favorite moments in Vietnam were biking through small towns and villages, with farmers working the rice fields, cows grazing in the ditches, and kids playing in the streets, many of them throwing you the peace sign. The nuances of everyday life. 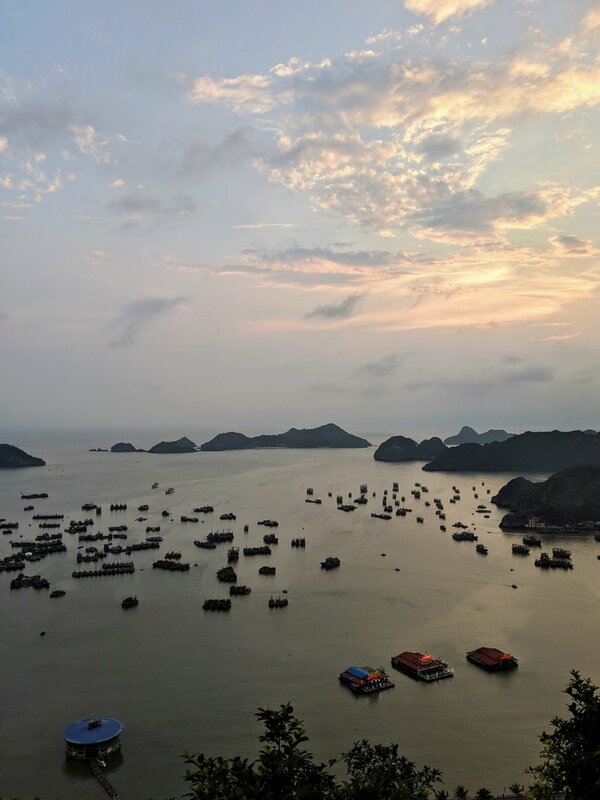 One day, around the golden hour of 4pm, on the ride from Cat Ba to Hanoi, we took the longer route to avoid the busy highway, and ended up driving through a small village just as school was getting out. Uniformed kids were flooding out of the school yard, this song was playing in my headphones, and it was, in every sense of the word, delightful. 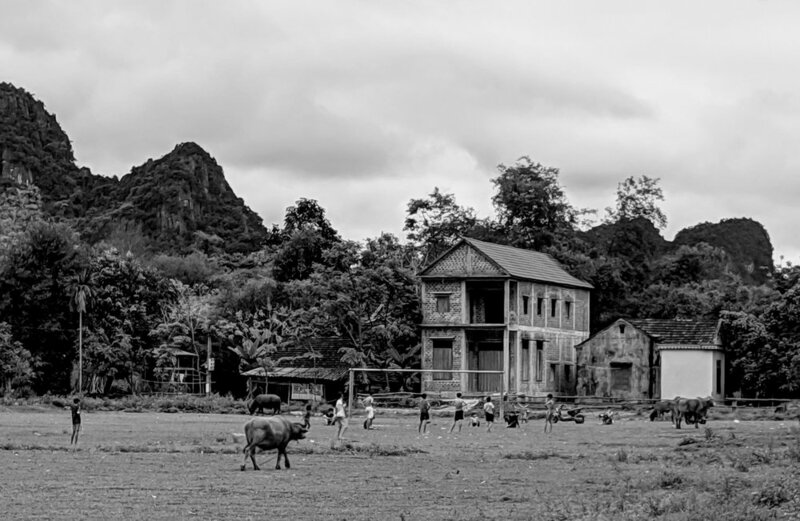 A small slice of Vietnamese life that, for whatever reason, I was lucky enough to experience. Each day I felt more and more confident on the bike; dodging stray dogs, weaving around potholes, and passing dirty, dusty delivery trucks. When we finally arrived in Hanoi, after nearly a month and 500 miles on the road, I felt at least a quarter as cool as the locals. Although driving a motorbike may not be the safest way to explore Vietnam, it is, without a doubt, the most fun. If you don’t belive me, just listen to the Queen. Every morning (and mid-morning, and afternoon, and early-evening) felt like a great time to treat myself to a Vietnamese coffee. I’ve always stuck to black coffee, but Vietnam introduced me to the dark side. Or should I say, the milky brown side? The strong, dense, bitter coffee paired with thick, sweet, custardy cream is a match made in caffeine heaven. Especially when the ratio is roughly 50/50. On hot afternoons, you’d toss in some ice and, presto chang-o, you’ve essentially got a milkshake. 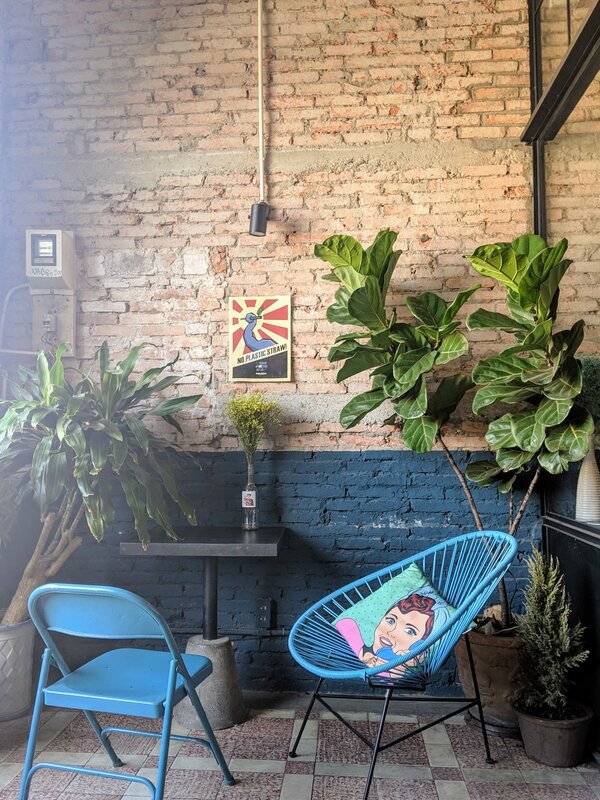 The Vietnamese café culture is the best I’ve ever experienced. There’s roadside stands, hip, westernized coffee shops, fun hidden reading nooks, garden oases, and everything in between. Amazing settings to relax and refuel. 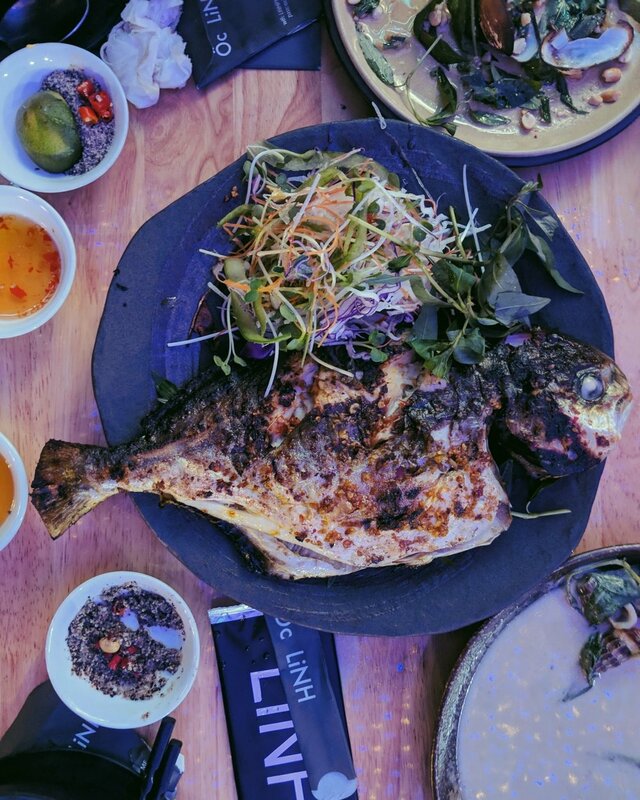 Unlike almost everywhere else in the world, the Vietnamese don’t just order a beer or two with their meal. They order a case or two for the table. And as the night goes on, and they begin to make a dent in the box, they toss each can under the table. Like putting a notch in their belt; commemorating each cold, canned accomplishment. On our way to Ninh Binh, Blas and I stayed in a sleepy, little city called Thai Hoa. We went out in search of food and came across a garage/community center/beer garden structure filled with, what seemed to be, the entire town, all with their eyes towards the projected screen (Thailand v. Vietnam soccer match. Vietnam won!). The place was radiating fun. We walked in and, despite being the only tourists in sight, were warmly welcomed. One very friendly, semi-English-speaking man came over and helped us order. We thought we were getting rice with chicken and a couple beers. What we actually got was boiled peanuts, kimchi, round, toasty cracker things, an entire chicken, complete with head and feet, dusted with powdered sugar, an extra-large bowl of rice with bits of vegetables and sausage, and A. Case. Of. Beer. Their confidence in our beer drinking abilities was both confusing and flattering. We came to find out that many restaurants will serve you a case at the table, you drink what you want, and then, when it comes time to pay, they charge you based on what’s left. An effective, efficient system. Extremely practical people, remember? The alcohol and sugar help with this step, but to really bulk up I’d suggest adding a heavy regiment of meat and carbs into your Vietnamese diet. Whether that’s a big bowl of noodles, a greasy, pork-filled sandwich, or both; the choice is yours. I, of course, went with both. 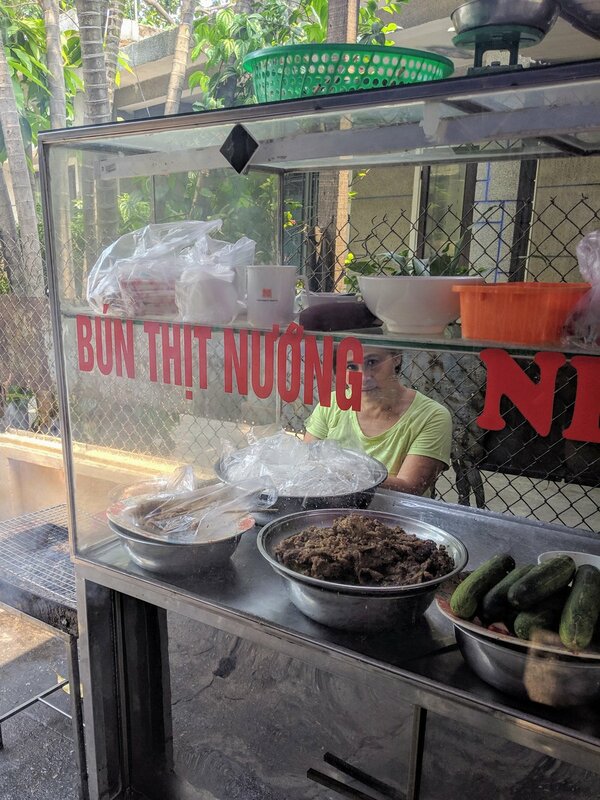 On any given day, it wasn’t unusual to eat eggs with toast, a banh mi, some sort of salty, crunchy snack, maybe another banh mi, a noodle dish, and ice cream. I mean, when you drink like the Vietnamese, you’ve got to have a solid food base, right? Fortunately, I found most Vietnamese food to be very fresh and bright; lots of crisp herbs, simple sauces, and semi-lean meats. So, although I ate a lot of food, it was a lot of real, whole, healthy-ish food. It seems fitting that the first thing I ate in Vietnam was a bowl of pho. I don’t know if it’s the national dish, but it may as well be. It’s eve-ry-where. I’m a sucker for a big bowl of brothy noodles, but I can’t say pho is my first pick. I tend to prefer something creamier, like ramen or laksa. Something a little less healthy, I suppose. Or something filled to brim with plump, porky dumplings. Like this beautiful bowl that Miah and Kelsey introduced me to. The perfect breakfast after a night of rooftop libations. And the best part is that it was served with a couple little surprises: A tiny tray of assorted dumplings and a love poem titled, Love Poem, revealed to you as you slurped away the salty broth. 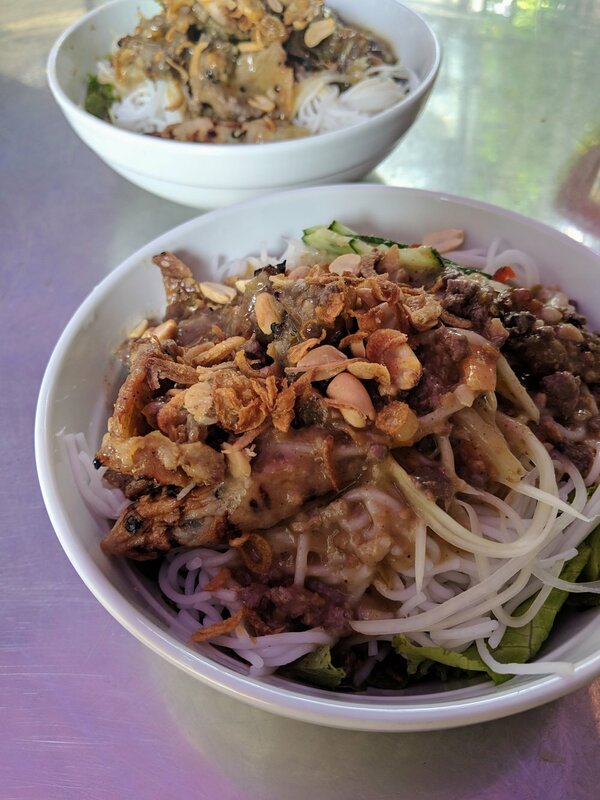 Another great breakfast dish was this noodle bowl topped with grilled meat and thick, salty peanut sauce. Served from this ever-so-unassuming stand in the alley. In general, that seems to be the Asian Golden Rule: The less flashy the establishment, the tastier the food. Another great example being this meal of fried rice and stir fried bok choy and beef. We ate this somewhere in between Cat Ba and Hanoi with mother and daughter duo manning the kitchen in perfect unison. You could tell they’d been doing this since the now-adult-daugher was a little girl. Although it looks modest, I think it was one of the best things I ate in Vietnam. It was savory, sour, a little sweet, earthy, but fresh. Simple food done very, very right. These were perfectly toasty and greasy, stuffed with spicy ground meat, cucumbers, and sprigs of cilantro. And they were served alongside a little jar of garlicky vinegar that added a perfect splash of acid. Again, they were from a completely random roadside stand. Essentially a family’s home, with an impromptu kitchen setup in the adjacent shed and some plastic chairs set out on the concrete slab. I knew Vietnam was going to be beautiful. But beautiful doesn’t even begin to describe it. I’ll start with the caves, which were particularly awful. Awful because they turned me into a pretentious cave snob who will forever have a ridiculously high cavern standard. The caves of Phong Nha were jaw-dropping-ly impressive. Huge! Architecturally impossible! With beautiful rivers running through them! And the tight, crevasses of Ninh Binh were mystical. Like I was 50% convinced we’d enter Narnia on the opposite end. While driving on the curvy, mountainous, country roads, pulling around a corner, I’d look up and be in total awe. Amazed and astounded by nature’s masterpiece. And then, ten minutes later, pulling around another corner, it would happen again. And again, and again, and again. The landscapes are so green and lush, picturesque and peaceful. They evoke an incredible, overwhelming sense of space and freedom. The absolute antonym of confined. Each region, each city, each hike, and each step offered a sensory-stimulating gift. Vietnam is practical. Vietnam is unbelievably beautiful. Vietnam is very, very fun. It’s a captivating country full of good-natured, resilient humans who seem to understand what it means to live more than most. I couldn’t recommend a visit more. 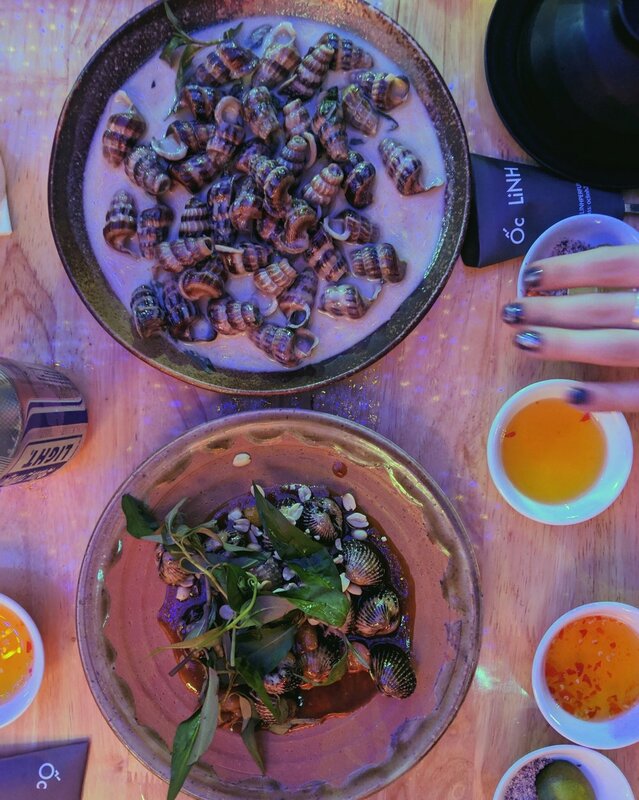 If you too want to have a ridiculously good time in Vietnam, follow this “guide.” Or don’t. Either way, you’ll be happy you did.